At an otherwise quiet Outdoor Retailer Winter Market in Denver, CO, last month, the Fjallraven booth was constantly buzzing with buyer traffic, and the din of all that business getting done had Nathan Dopp smiling. As the deputy CEO and president of the Americas for Fjallraven North America, Dopp was thrilled with the number of retailers who wanted to check out the latest offerings from the Swedish outdoor apparel and gear brand. He was even more stoked with the number of orders written. And while Dopp was plenty busy to start the event’s second day, he was able to step away from his booth duties to speak with SGB about some of the latest happenings at the company, part of Fenix Outdoor Group with sister brands Brunton, Primus, Royal Robbins and Hanwag. The first topic—in light of the surprising early morning activity at Fjallraven’s booth contrasted with repose elsewhere on the floor—was OR itself, specifically the new cycle of Winter Market in November, which Dopp said the team loves. He added that Fjallraven is committed to the entire three-show cycle—Snow Show in January, Summer Market in July and Winter Market in November—for a variety of reasons, including the desire to support Outdoor Retailer as well as Denver, since Fjallraven is headquartered up the road in Louisville. The successful Winter Market was another in a string of positive business signs at Fjallraven. On top of double-digit growth, the company avoided some potential headaches by moving production out of China a few years ago to focus on Vietnam, a “move to diversify and not be too tied to the China market,” Dopp said. Even if the trade war eases up—which appears to be happening—the company’s ability to avoid global economic conflict was fortuitous, he said. Fjallraven has also cleaned up its Amazon presence by limiting sales there to one partner at full price, giving the company more control over its distribution. More than anything, however, the brand is clearly comfortable in its own arctic-fox-logoed clothes, as evidenced by a growing team, success across channels and a heightened focus on expanding the brand’s presence even further. 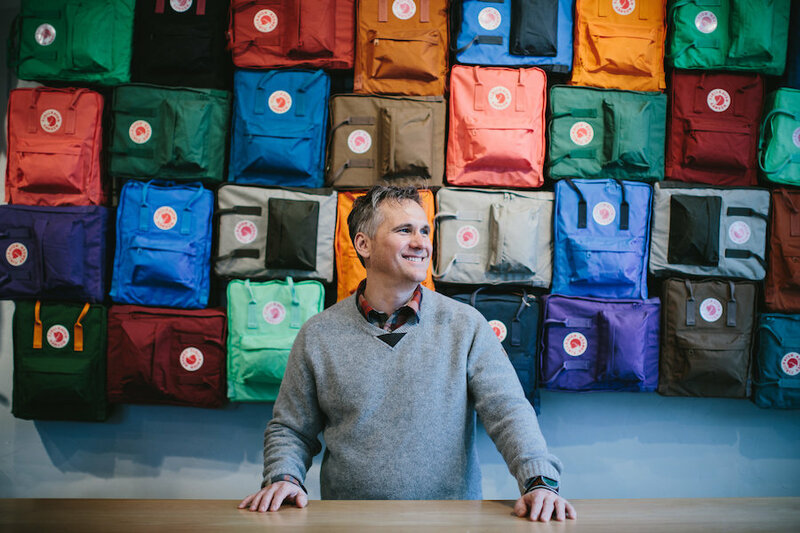 Here is the rest of what Dopp shared about what’s happening at Fjallraven North America, including a new marketing emphasis and why sustainability is a component of the brand’s roots and future. What’s on tap for 2019 for Fjallraven and what’s driving growth for the brand? The biggest initiative going into 2019 is a marketing shift for us to the specialty side. As a new brand in the market, we really needed to get the brand out there—how do you pronounce [Fjallraven], recognizing the logo. But now we’re trying to drill down and be much more specific. We’ve just hired a team of five in-house field reps, so they’ll be going around to specialty accounts and reinforcing the brand message. We hired the first five, but I could see a future of even more reps who will work in conjunction with our sales agencies dedicated to the specialty side. We’re fortunate because do a really nice sizable business with some of the big stores—the Nordstroms and the Urban Outfitters—and frankly it finances a lot of things for us. So we’re able to rededicate that money to this core base business that we really want to grow. What are some examples of your marketing efforts? We’re on our third year of a billboard in Times Square for just that brand recognition. It’s also a great global play because, of course, anybody who comes to New York goes to Time Square and they get to see the brand. So we hear back from a lot of people, which is fun. In the past we’ve obviously had a smaller marketing budget, and we’ve dedicated almost all of our resources to fourth quarter to get that winter business going. Next year we will shift backwards a bit so we’ll split a good portion of money into quarter one, quarter two, and then quarter three coming off of back to school. We’re hiring our first influencers and we’re doing a lot more on the digital asset creation side, but we’re also staying true to our traditional media, which is still a very important part of our future. What’s happening with your e-commerce channel, and is that continuing to take a bigger slice of your overall revenue? It is the one of the fastest growing pieces of the business. We’ve been fortunate. We’ve had double-digit growth since we started, and that’s great; I don’t see any reason that won’t continue. With e-commerce, between channel management and cleaning up the pricing structure and all that, we’ve seen nothing but benefits from it. When we cleaned up the Amazon business and we were able to get out of that business, we’re just seeing lift with all of our existing partners. I thought it would take a little longer, but frankly it’s been great. It’s almost instantaneous—if you can eliminate bad distribution, your good partners will benefit. It sounds like sustainability in an authentic way is an integral part of the Fjallraven message. We are speaking to that next generation, and they are looking for more durable goods and brands that they can believe in. We make no bones about the fact that we were very fortunate in the timing of bringing this brand to the States. The look and the feel and our brand ethics were very timely and we’re just trying to use that to our advantage. It’s great time for us now. So maybe it wouldn’t have worked 10 years ago. I feel like this is a longstanding trend. Coming out of the Recession, I felt like people stopped wanting disposable gear. They don’t want disposable cars, disposable gear, disposable goods. Seven of our top 12 items are more than 30 years old in styling. We have items that are much older than most brands and I think that’s a testament to our durability. We want to be innovative, but we don’t say, ‘Let’s see how many innovations we can get through the channel.’ We’re very deliberate about our innovation—it took us about eight years to do our eco shell, with recyclable membrane and non-PFC waterproof treatment. That’s where we like to live and I think it gives us a really nice foundation to continue on. That’s where we came from and that’s our path. Eric is Senior Business Editor at SGB Media. Reach him at ericsmith@sportsonesource.com or 303-578-7008.